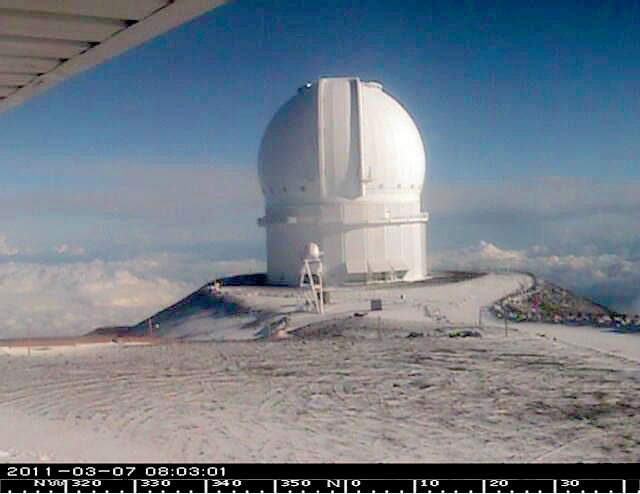 A winter storm warning remains in effect for the summits of Mauna Loa and Mauna Kea until 6 a.m. Thursday (Dec 21). 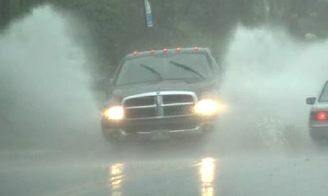 The National Weather Service has downgraded the Warning to a Flash Flood Watch. A Flash Flood Watch means flooding is still possible. The National Weather Service in Honolulu has cancelled the Winter Weather Advisory for Mauna Kea and Mauna Loa at 3:35 p.m. Tuesday (Dec 20). The the thinning cloud layer over the summits decreases the chance for snowfall. At 3:10 p.m. it was reported that the Mauna Kea access road was open to the public. The National Weather Service in Honolulu has issued a winter weather advisory…which is in effect until noon HST today. A mixture of light sleet and light freezing rain may accumulate on the summits this morning. These icy conditions would most likely affect elevations above 12 thousand feet. Winter weather advisory still in effect for Big Island summits until 10 a.m.
Winter weather advisory now in effect until 10 am HST this morning. Isolated snow showers may occur this morning. Freezing drizzle or patchy freezing rain may also deposit a thin layer of ice on exposed surfaces. Additional accumulations of 1 inch of snow and or ice are possible.